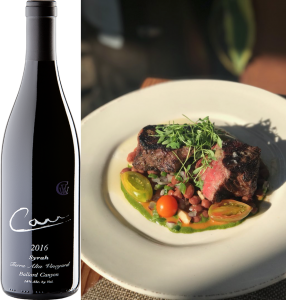 The 2016 Carr Syrah from Tierra Alta Vineyard is a complex and delicious full-bodied wine, perfect for pairing with red meat. Chef Julian Martinez from Barbareño knew that this was the perfect wine to drink alongside a Santa Maria style tri-tip – a classic Central Coast meal. 1. Place the beans in a large bowl. In another bowl, combine ½ gallon of water with 2 teaspoons salt. Stir to disperse the salt, then pour over the dry beans. Soak the beans in brine overnight. The next day, strain and rinse the beans, then pour into a heavy stockpot and cover with 1-inch water. Add one diced red onion, sliced garlic, Bragg Liquid Aminos, and the hard apple cider to the pot. Bring to a boil. Simmer until beans are tender, about 2 hours. 2. Meanwhile, prepare and begin cooking the meat. Combine all the ingredients for the dry rub in a bowl. Liberally rub the tri-tip with the spice rub. Place the tri-tip on a rack set and let sit at room temperature for 1 hour. 3. Fire up the grill, ideally using red oak wood, 30 minutes before cooking. If using a Santa Maria style grill, raise the grate to highest position. Place tri-tip on grill. Cook, turning every 5 minutes – turning the meat often keeps the juices in the meat, rather than dripping down into the fire. Cook the meat until the exterior of the tri-tip is charred and the internal temperature is 130-135ºF. Remove from heat and place several pads of butter on top of the meat, letting it melt in. Let rest at least 10 minutes. 4. To finish the beans, heat olive oil in a pan. Add the minced garlic, cumin, coriander, salt, and ground red pepper. Cook, stirring often, until very fragrant. Add the remaining diced red onions and cook over medium-low heat until onion is softened. Set pan aside. 5. Once the beans are done, add about a cup of beans to the onion and spice mixture in the pan. Mash the beans to incorporate it with the oil. Add this to the pot of beans, along with the brown sugar and the remaining liquid aminos. Cook until reduced sufficiently. Once done, add the apple cider vinegar and cook a few minutes more, stirring. Season to taste with apple cider vinegar and salt. 6. To serve, slice the meat thinly across the grain. Serve with pico de gallo and pinquito beans.